Put the screens away and enjoy family fun time again with a classic game of custom dominoes in kid-friendly style that include your favorite family photos. 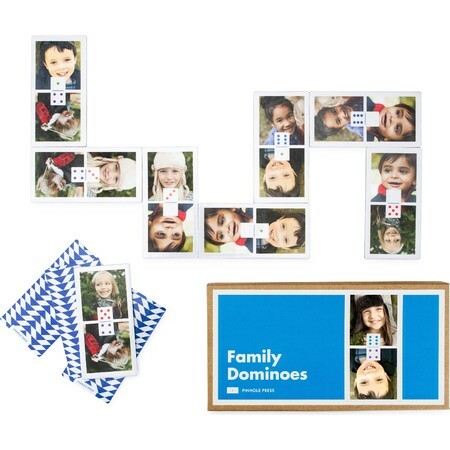 Choose seven favorite photos and create custom dominoes that provide outstanding quality family time for ages 3 and up. 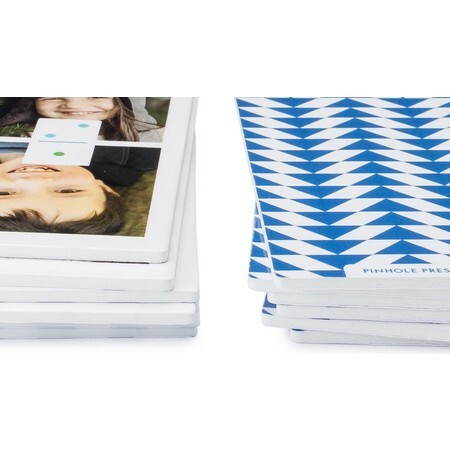 Play by matching family photos (or numbers) until someone runs out of dominoes. Custom dominoes provide a fun way for your child to learn about numbers and colors and have fun at the same time. Please Note: These dominoes are made from paper, not plastic or ceramic, like traditional dominoes. Use photos from a recent vacation, birthday party, family trip or family reunion to create a game that’s truly yours. Pinhole Press custom dominoes include a set of 27 tiles measuring 2 inches by 4 inches and arrive in a box with a label you design. The custom box makes it easy to take dominoes on the go.